Selling raffle tickets at your school fair/fete or charity event can secure extra fundraising and grow your supporter database at the same time. It’s a must do, but it comes with a whole lot of baggage. 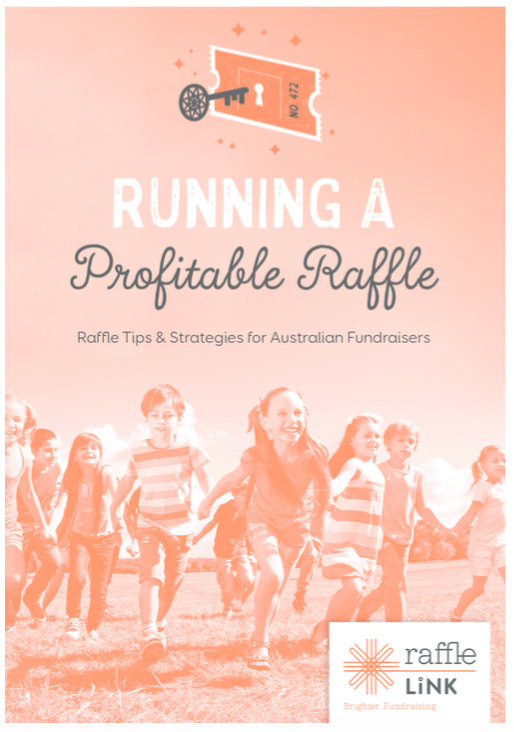 In the past, like most fundraiser you’ve organised printed raffle tickets so that you are able to sell face to face to event attendees. It’s a giant headache right? So you go online and hope and pray that since last year, a new alternative to printed raffle tickets has come along. Bingo! You’ve found this blog and it will save your sanity. Now, with technology there is an alternative to printed raffle tickets. Thanks to client feedback, we’ve designed an easier way to sell raffle tickets for cash at your event which is sure to put a spring in your step. RaffleLink’s cash receipting function add-on is useful for raffle ticket sales at all kinds of events such as school fairs, sports open days, community festivals, trivia nights, gala dinners or morning teas. 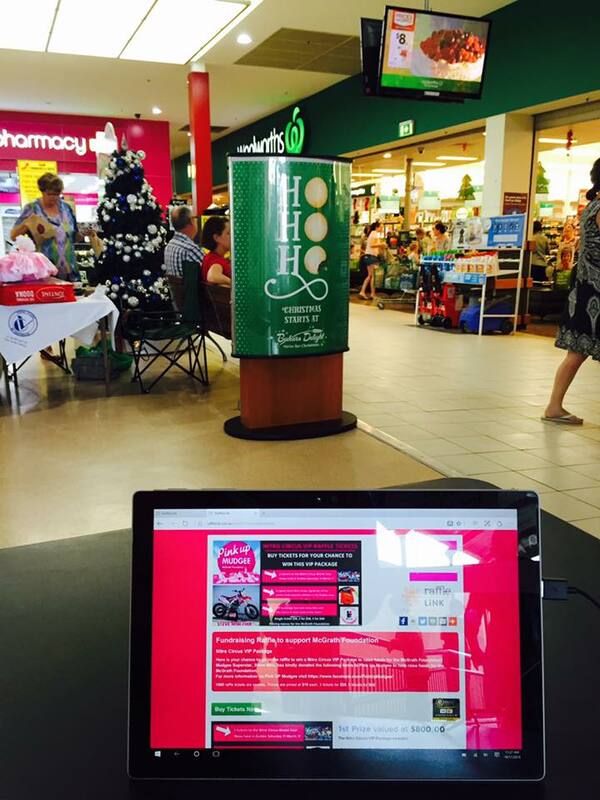 The Pink Up Mudgee Campaign raising funds for The McGrath Foundation sold tickets for cash via a laptop outside of Woolworths. To have the best of both worlds opt in to receive cash payments as well as credit cards whilst retaining all the online raffle functionality. What does this mean for you – the raffle coordinator? It is much easier to sell bulk raffle tickets achieving a higher sales transaction than write out 10 tickets with buyer details. Then (on the same device) go to your raffle page and you will see an additional check box for cash sales in the buying section just above the credit card details. NOTE: If you are not logged into the Admin then the cash box will not be visible. Ticket buyers paying with cash will still receive a RaffleLink raffle ticket receipt via email. Cash sales mess seamlessly with the system’s other functionality. Cash sales & credit card sales will be separated in your onscreen Sales Per Day Summary so that you can reconcile cash you’ve received against recorded sales. In the Ticket Purchaser Details section cash sales will have “Cash Payment” in the Receipt # column. All transactions paid by cash through the RaffleLink system will be included in the system’s automated draw and raffle reports for use in a manual draw. RaffleLink’s service fee of 6%+GST does not apply to cash sales. Any proceeds invoice you receive from RaffleLink will exclude cash sales. Instead, RaffleLink has a one off access fee of $100 inc GST to activate the cash receipting function for your raffle. Better still, you can retro-fit the cash receipting function to your online raffle even after it has commenced. Start selling raffle tickets by credit card online well before your event and secure wide-reaching sales from those who cannot attend. At your event, offer both credit card and cash sales to maximise raffle ticket sales. To learn more about online raffles get in touch.